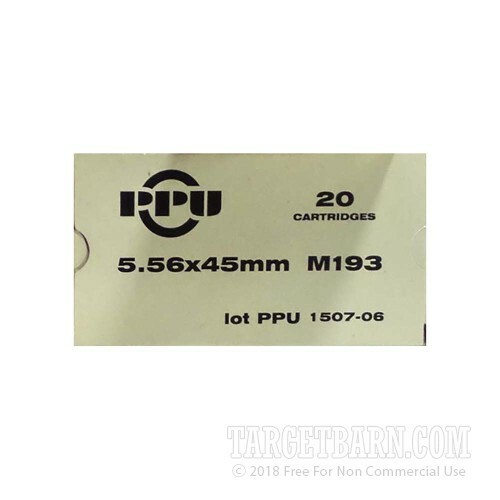 If you like to train with mil-spec ammunition for your AR-15 or other 5.56 NATO rifle, try these cartridges from Prvi Partizan. 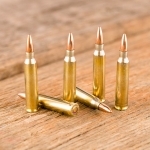 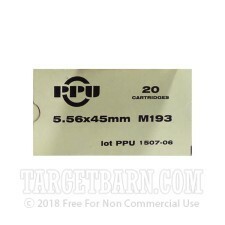 This ammo is loaded to the M193 specification and can be used with other ammunition of the same type without much (if any) adjustment to your optics. 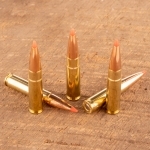 Each round in this box of 20 fires a 55 grain full metal jacket bullet at 3,240 feet per second. 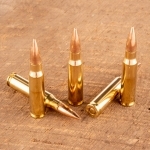 The bullet is boat-tailed to provide better extended-range stability. 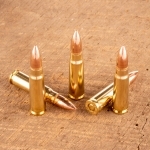 Prvi Partizan ammo is made in Uzice, Serbia using non-corrosive primers and brass cases with intact annealing marks.